ISHPEMING TWP. 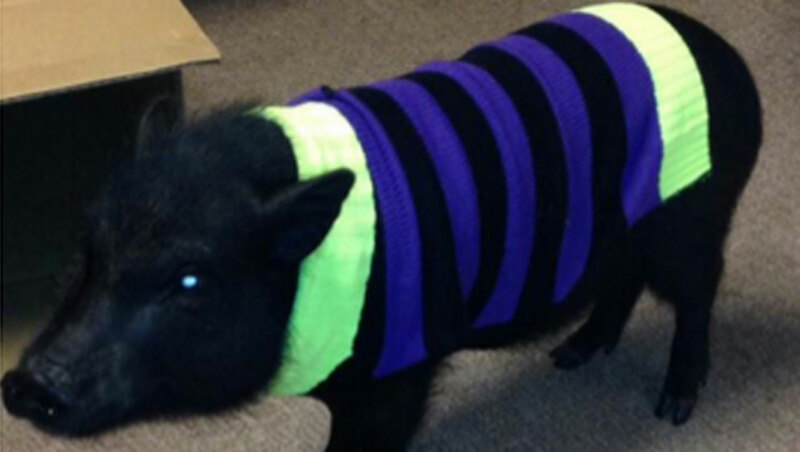 - A northern Michigan family is upset after a state Department of Natural Resources officer fatally shot their miniature pet potbelly pig that was on the loose, CBS Detroit reported. Brandy Savelle and Tony Gervasi say they got the pig named Caesar about two years ago and had been training the animal to be outside. Last week, they posted on Facebook that the pig -- about 15 inches tall and 30 pounds -- was missing, and followed his tracks. "When I followed the prints ... it was like a puddle of blood, at first I didn't believe it," Savelle told WLUC-TV. "I just started screaming for him." A day later, a Natural Resources officer showed up at the couple's door, according to a GoFundMe page. "We figured he had information so with excitement, Brandy answered the door asking if he knew anything about the pig. The man responded 'Actually, I am responsible for the missing pig...' Not knowing what he meant, we asked. His answer being, 'He came out of the woods at me running at a trotting pace and I felt threatened so I shot and killed him.' Jaws dropped in disbelief, tears and anger flew," Gervasi said. According to WLUC, the shooting, which happened on state land, is permitted because the animals can carry disease and damage property. Peter Wright, a law supervisor for the DNR, told the station that the officer was just doing his job. He said the officer believed it was a feral pig, since it had no identifying marks to distinguish him as a pet. "I want to make it very clear that it's never ever, ever the department's position that we want to shoot people's pets," said Wright. "If he had any inkling it was a pet, he absolutely wouldn't have shot it." The Upper Peninsula family said via their Facebook page that they have been told "that the body under no circumstances will be returned to us unless we accept it in ashes." Savelle, who has attorneys fighting to retrieve Caesar's body, said she doesn't want the DNR to end up shooting another pet - of any kind. "If it was that big of a mistake then we would like to see better training," she said. "Let's learn to identify not just pigs, but all pets."